This outfit post came about because when we visited our alma mater (Mizzou) last weekend I realized that I no longer owned any "going out clothes," which raised the question: what does one wear to a college bar in their twenties? Both evenings I opted for simple separates... A long cream blouse, skinny jeans & heeled booties the first night (plus jewelry & bold lips), and a similar outfit to the one above (except I substituted boots) the second night. 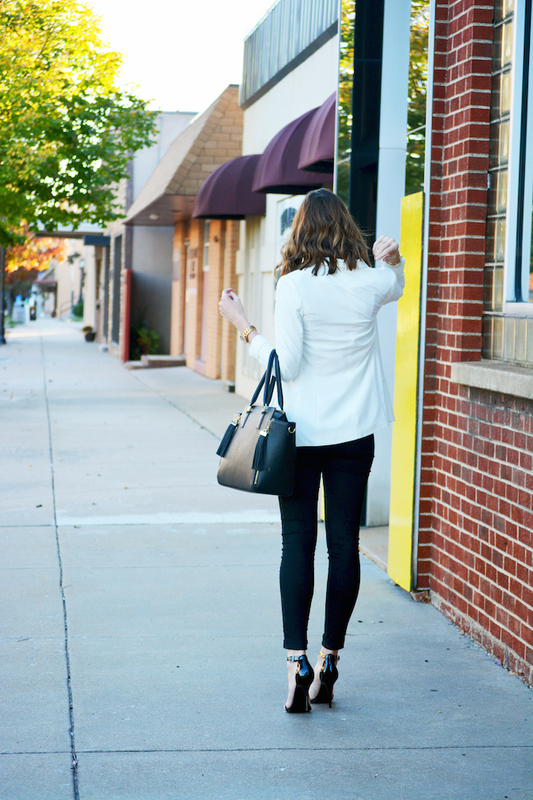 All of this made me realize how important it is to own chic, staple separates! Pieces like black/cream/white blouses, black & dark denim skinnies, and black/cream blazers can be worn anywhere from the office, to a date night, to a family gathering, and even on a night out (like I did). Having these versatile staples in your wardrobe will stretch it further because they're so versatile and mix-and-matchable. Congratulations to the winner of my monogram earrings giveaway with Dots of Happiness - Paige Pierog!